Are High Heels an Alexander Technique Teacher's friend? Now you might think this a strange question for an Alexander teacher to ask and in many ways I would agree with you. High heels produce so many back and foot problems for their wearers and many of them come for Alexander lessons - so it could be said that high heels help to keep us in work! But of course I do encourage women not to wear them. I actually feel very concerned when I see all these fashionable young women teetering around on stilettos, often wearing a restricting tight skirt, sometimes holding a toddler and pushing a push chair; I also see their exaggeratedly-arching lower backs and various other sorts of distorted body use and crippled toes. It is obvious to see that women wearing very high heels are creating and storing up trouble in their bodies - and they are creating work for doctors, Alexander teachers, osteopaths, podiatrists and others for years to come. This may be helpful to Alexander Teachers during a recession but that gives me no pleasure - those shoes could work out to be very expensive for the wearers in the long run! This was the name of an excellent article 'on a very modern torture' by Polly Vernon in The Times Magazine (22.10.11). Heel heights were rated for pain and discomfort and the 6 1/2 inch high heels were give a 10/10 pain rating! Why do women agree to suffer in this way? The article discusses back and foot pain and a podiatrist states that he has treated women whose tendons 'were so retracted they can't put their foot on the floor any more'. An exaggerated claim? Unfortunately, no. I had two Alexander pupils who always wore high heels - even their slippers had high heels! The result? Neither of them could put their heels down on the floor because it was too painful to do so! 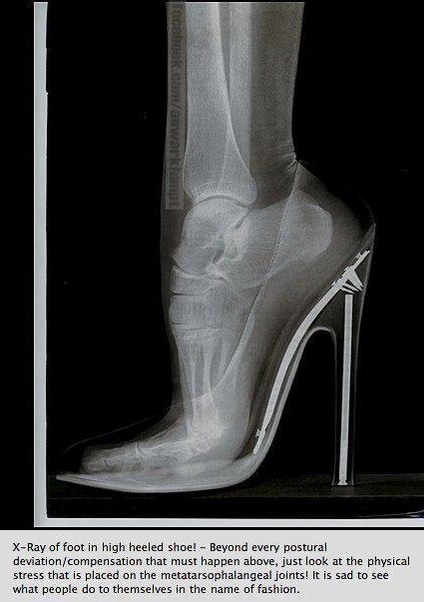 Their muscles and tendons had shortened so much from wearing high heels. Both women had a lot of lower back pain and when they lay down there was a gap of several inches between their lower back and the Alexander table (far more than most people). Some other pupils have had grossly distorted toes and painful bunyons, because of their high heels. Sadly,they preferred to keep their high heels, rather than allow their bodies to become less distorted. However it is possible, through having AT lessons, to undo some of the damage, if women are willing to make some changes in their footwear and in their habitual way of using their bodies. Why are high heels so damaging? When such high heels are worn, the pelvis gets thrust too far forwards and extra weight is pushed down into the hip joints, and weight goes too far forwards over the toes. The higher the heels, the stronger the imbalance that is created. In order to be able to stand upright, the upper body then has to pull backwards, creating an exaggerated curvature in the lower back - lordosis - which compresses the vertebrae and frequently ends up damaging the discs and in particular the lumbar spine, which causes lower back pain. These downward thrusts interfere with the way the body naturally functions and can also distort the woman's natural poise. The women's poor feet in these high heels are also damaged. The higher the heel and the more pointed the shoes, the more damage is caused. The toes are kept in a dancer's demi pointe position with the weight of the body thrust onto the ball of the foot - for hours on end, often with the toes crumpled up in order to fit into the narrow shoe. These increasingly painful feet now begin to create their own problems and also interfere with the way the woman stands, walks and generally uses her body. Are high heels really worth this risk and high cost? As for the woman's ability to run if she so chooses, or more importantly needs to run, forget it. Fashionable women today are almost as packaged up and hobbled as Chinese women used to be in centuries past, when they had their feet bound-up so they were permenantly damaged. And whatever happened to Women's Lib? 'To preserve personal beauty, women's glory! the limbs and faculties are cramped with worse than Chinese bands, and the sedentary life which they are condemned to live.... weakens the muscles and relaxes the nerves'. Wollstonecraftcomplained women were 'slaves to their bodies, and glory in their subjection... Taught from infancy that beauty is woman's sceptre, the mind shapes itself to the body, and roaming round its gilt cage, only seeks to adorn its prison'. It is an interesting challenge to an Alexander teacher to work with such problems and to help women to feel good about themselves just as they are, so the urge to wear such attire, depite the risk they pose for the wearer, can gradually lessen. Women gradually understand that they can only lose their various aches and pains when they are willing to make changes in the way they habitually dress, as well as the way they habitually use their bodies. However, with a willingness to learn the Alexander Technique and apply it in their daily life, people can gradually learn to ease the discomfort in their backs and legs and avoid such problems in the future. During lessons, women can learn how to let their tightly-arching lower backs to release and lengthen out again, so that less pressure in put on that area. With the teacher's guidance, they will be able to re-align their bodies and regain their natural body balance. For women who are very conscious of the way they look, a good incentive for them to make such changes is that they will also help themselves regain their natural poise and elegance during Alexander Lessons. Save your high heels for parties! So please inhibit and say 'no' to wearing such high heels regularly. If you really love to wear them, save them for extra-special occasions and resist the temptation to wear them all the time. If you sense that aches and pains are starting to arrive in your body, address the problems now and learn the Alexander Technique before the problems build up and create real pain. You will soon be grateful if you learn to look after yourself - but do it sooner, rather than later.